Currently out the front? - CLICK HERE to get your Name in Lights! This site is about my personal Christmas Lighting display. Brad's Christmas Lights is a music synchronised display that has been custom built using the latest in digital LED pixel lighting technology. You can also "Get your Name in Lights!" by connecting your phone/tablet to the Xmas Lights WI-FI hotspot portal. Enter your name and it will appear on the house roof* - all in real-time and in sequence with the light show. See below for more details about my display, including location & operating times. *Please Note: The interactive Wi-Fi aspect of the display is often switched off at 9PM on 'school' nights to reduce over-excitement. Don't be late! Lights will go OFF automatically upon finishing time! On slower nights packing up commences earlier. The best parking can be found around the corner in-front of the soccer fields as per the map below. As the street is only two cars wide - and a dead end - there will be no street parking available for Christmas Light visitors. During extremely busy times, you will not be able to stop your car at all. The display will not be operated in bad weather. Check this website for 'live' updates to see if lights are running. Do not block the street or driveways. Watch out for passing cars & children - they might not be see you at night! The display is currently about an 14 minute loop of nine songs. However this may will be reduced during peak-times to assist with traffic or crowd management. Interactive Wi-Fi may also be disabled during such events. Large buses/coaches will be impossible to turn around if there are any cars at the end of the street. Unfortunately my street is also not suitable for large convoys. A sudden influx of vehicles can result in chaos as everyone tries to turn around / navigate existing parked cars/people. Please contact me for alternative arrangements! Many displays - including this one - will get busier as Christmas approaches. Plan your Christmas Light visiting earlier in the month to avoid missing out! Also with the Summer storms around, it's often best to get in before there's a week of rain! Each year I video my Christmas Lights and these can be found on the video page of this website. You'll also find other Christmas Light related videos on my YouTube page. New Pixelised roof reindeers. Upgraded LED strip on house/roof outline! Look closely because every single LED is individually programmable! Custom-built, Video synchronisation, using digital signage parts! No pre-made/purchased sequence templates used! Uses much less power than you think! How big is your electricity bill? The entire display only adds about $1 per night to the power bill. I'll spend more on cable ties. LED lights use very little power. Doing the ironing will actually use double the power than this entire display. For the nerds we are talking ~1500Watts when all LEDs are on (vs 2400W for an Iron). Power consumption varies greatly during the show as not all lights are on at once. Displaying a single primary colour (like red, blue, or green) also reduces the load as their other two colours (to mix) aren't required. How long does did it take to setup? Many of the elements within the display are pre-built during the year (or built in previous years). Physical assembily & testing on the house takes about three weeks during November. How long does it take to sequence the lights to music? Each song takes approximately ten hours per minute of music to sequence. Yup it is a slow process of mapping various effects out to each bar of music within the song. This process is then repeated for each element in the display - be it the roofline, Christmas tree, front garden edge, etc. I'm in IT, working in System Operations, Networking and similar Level 3 tech support fun. What sort of LED's change colour like this? Unlike your normal store-bought Christmas Lights, digital LEDs "Pixels" are fully programmable so each one can be programmed for its own colour & brightness. Every LED pixel node is numbered and their physical location is programmed in to sequencing software that is used animate the lighting effects. How does the interactive Wi-Fi aspect work? B) web portal software for visitors to interact with in order to request their name. On top of this is a database-driven system backend to manage/filter/coordinate requests. Then on top there's the IT side of networking it to the Wi-Fi captive portal. Can I pay you to do my house? As professional as my display looks, this is merely my hobby. My own display already takes considerable time & effort to organise, on top of already working full-time! How can I learn to build a display like this? How should I start out doing some simple Christmas Lights? Start out by using the lights to outline your house, eg: gutter, around front windows, then roofline if you like climbing on the roof. If you don't like heights you can always shine a coloured light up a wall or tree from the ground too! Does the radio station / Christmas Light competition pay you to do lights? Do you get a discount on the power bill? Why aren't my lights on in the rain? Two reasons. 1. My lights are not the same as your normal cheap Christmas Lights from the shop. Whilst I design everything to be waterproof I'd rather not risk damaging them considering... 2. Since the street is narrow, road safety is also of concern whilst it's raining. Why don't you leave the lights all night? A display this size draws crowds and requires constant supervision. I'll be the first person to say that I don't want to hear extra traffic at midnight whilst trying to sleep too! Volume of the speakers is often reduced when there isn't many people around. Volume will often be reduced if any spectators are too noisy. Are you authorised to fundraise? Yes. Letter of fundraising authority will be attached to the letterbox. How long have you been putting up your Christmas Lights? How long have you been computer controlling Christmas Lights? Where do you get/buy the 'name in lights' thing? You can't. This is entirely custom programmed via 1000's lines of code to create custom software for this task. Believe it or not one Christmas Light vendor actually told me they've had multiple inquires about it! How does the 'name in lights' system prevent swear words from appearing on the roof!? There is a database which contains a 'whitelist' of 131,000+ known first names. The system also knows many 'nasty' words - and will auto-ban any one accordingly in self-defence! 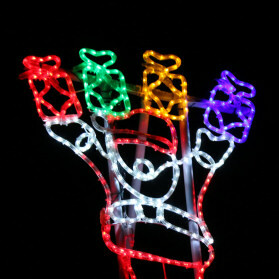 Are you in the 4KQ Christmas Lights Competition? Aren't you worried about someone stealing your screen on the garage? The LED Matrix screen on the garage is taken inside each night. I would've made it even bigger - but i had to factor the weight/portability of moving each night! Where do you get your sequences from? What do you think about purchased synchronised sequences being used in competitions? Do the lights run all night? Any media enquiries are welcome. Will Brad be around for questions whilst we are visiting the display? Of course! If I'm not already out the front, I won't be far away.